When we think anatomy, we often think of high school textbooks showing cross-sections of stomachs, and skeletons. But like humans, every organ is unique in how they look and behave. Despite these difference, like humans, they share the same parts to create that unique look and sound. 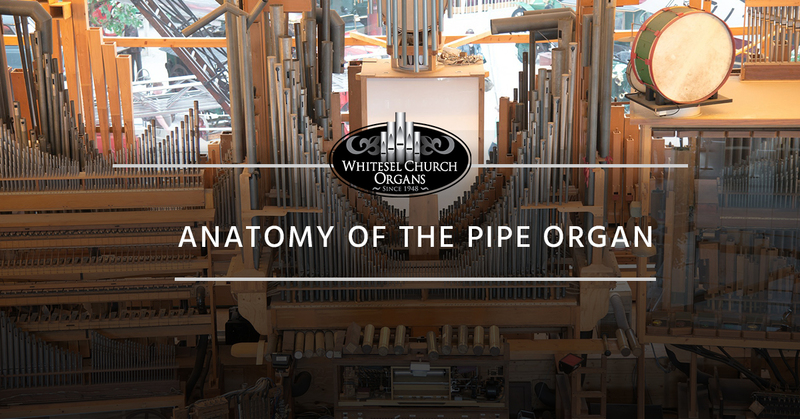 Whitesel Organ Churches is ready to teach you the anatomy of the pipe organ. Read on to find out more! At its most basic form, the pipe organ is made up of four parts. These parts all work together in harmony to produce the classic sounds of a pipe organ that we all know. These four parts include the console, the pipes, the action, and the wind generator. The console consists of the keyboard, the stops, and the foot pedals. The arrangement of the console can vary from pipe organ to pipe organ. Most pipe organs typically have two to five keyboards that all play different sounds, so the organist can blend them together to create a more complicated and dynamic note arrangement. The stops control the amount of pressurized air that is allowed into the pipes, thereby controlling the volume of the instrument. The foot pedals are used to play the deep bass notes of a piece, and require the organist to actually press them with their foot in coordination with the playing they’re doing on the keyboards. The pipes are perhaps the most noticeable part of a pipe organ. In some instruments, they are just a few inches tall, while in others, they can stand as high as 32 feet! Pipes can be found in two forms, flue pipes, and reed pipes. Flue pipes are a hollow cylinder with an opening on the side of the pipe. Reed pipes are also made from hollow cylinders, but rather than an opening on the side, they use a vibrating piece of metal that is attached to a hollow cone. When air is forced through these pipes, they resonate and create the various sounds of the organ. The size and diameter of the pipe dictate its tone. The largest pipe organ in the world has an astonishing 28,500 pipes! The action links all the assemblies and pieces of the organ together. The action is connected to the console and allows for the control of air to the pipes by using various cranks, rollers, and levers. Actions may be mechanical, pneumatic, electric or even electropneumatic. Each type of action uses different processes to perform the same function. The pipe organ is distinctly a wind instrument. As such, it needs a lot of wind to create the incredible array of sounds that makes it so unique. Most modern pipe organs use a rotary blower that is powered by an electric motor, which produces a constant, consistent stream of air to meet the needs of the organist and their instrument. Older pipe organs or smaller pipe organs use a hand-pumped bellows to provide air. 07Thanks for joining us for our brief overview of the anatomy of the pipe organ. At Whitesel Church Organs. we’ve been both students and teachers of the pipe organ for almost 70 years. We’re experts in pipe organ maintenance and repair. We offer new organs, including a fine selection of quality organs from Viscount Organs. Reach out to us today to find out more!